Pros: It is ideal for families that enjoy camping outdoors. It folds up small and can be carried as hand luggage. It can also be used as a playing area. Cons: It can be confusing to set up. It can be difficult to use sheets in the crib. The Phil & Teds Portable Traveller Crib is a lightweight, durable and compact crib that makes traveling so much easier. It is collapsible and can be packed in a matter of minutes, making it the ideal travel companion for families. Parents who travel and want to take their kids with them or want a portable travel crib for the home. It is also ideal for large families who are short on space, as this crib can easily be folded up into a compact bag. It is also good for families at the beach or out camping. The first time setting up the Phil & Teds can prove to be challenging. It’s reasonably straight forward but I would guess it took me about 15 minutes to assemble all the pieces together the first time. Once done though, it becomes easier every time it is assembled and now takes me a few minutes. In terms of portability, the this crib beats most others that are currently available on the market. 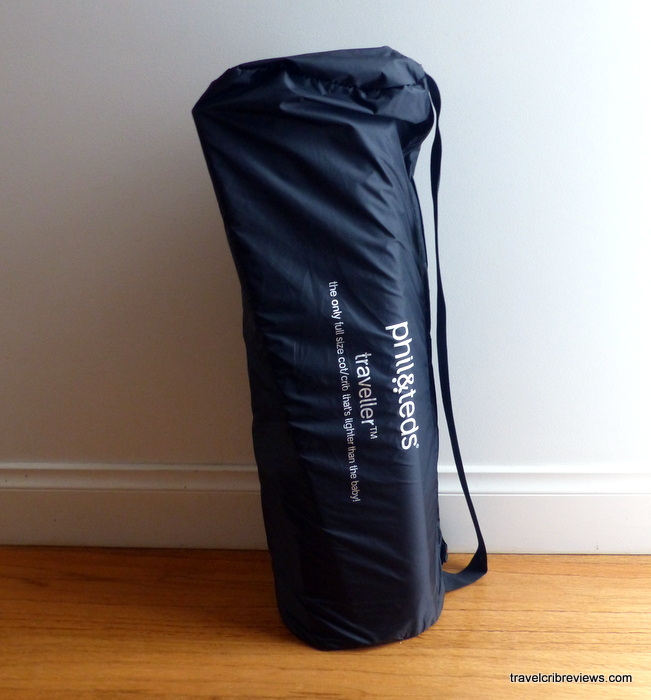 This can be attributed to the fact that it can be folded up very small (only 27 x 10 x 8″) and it is lightweight at only 7lbs. It fits into any long traveling bag or large suitcase, and it will not take up too much space. The crib comes with a shoulder strap that makes it easy and comfortable to carry around. It is mostly made out of nylon material which is soft enough. It comes with a self inflatable mattress and a sheet which are comfortable and work well. This Phil & Teds comes with mesh on the sides that make it easy for you to see what your baby is up to inside the crib as well as giving good air flow. This portable crib can comfortably be used by your baby, from the minute they are born until around 4 years old. It is durable and strong enough to support the growing weight of your child. Its durability ensures that it can be passed down for use by other siblings as well. Once set up, it is solid and stable, so you do not have to worry about it toppling over with your baby inside it. The mattress is also thermally insulated, providing warmth for your little one at all times. The Phil & Teds Portable Traveller Crib comes with side flaps that most children have fun with, as it allows them to crawl in and out of their crib easily and makes it a good option for a play yard too. It comes in silver or graffiti designs. There is also a sun cover mesh which can be purchased for this crib and a sheet set. The Phil & Teds Portable Traveller Crib is a great choice for families that want a portable travel crib that is lightweight, suitable from birth and folds away small. We use it a lot and are huge fans! 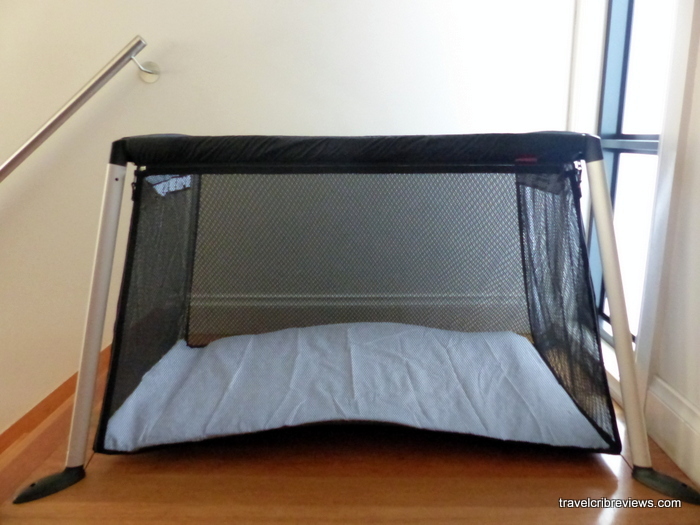 Still unsure which travel crib to buy? Check out our buying guide!